Founder of Changing Horizons and Director of Mindful Aid is a leading public speaker on mental health. He delivers educational, engaging and inspirational talks to schools up and down the country. Stu gives you a fresh new perspective on transforming the stigma surrounding mental health whilst raising awareness of mental health. He has featured in two award winning BBC documentaries, written for some of the UK's leading publications and was a key member of a seven year Governmental campaign that tackled the stigma and discrimination of mental illness in the media and workplace. Stu combines his experiences of suicidal depression and self-harm with his experiences as a Expediton Leader and Professional Adventurer. Stu's dramatic recovery from suicidal depression began with a 4,000 mile bike ride across SE Asia. He then went on to live in the deepest, darkest jungles in Belize; walk over 2,000 miles across the US meeting all sorts of weidrd and wonderful people; spent six months building sporting facilities for a rural community in Cambodia and has now gone on to lead over 40 expeditons on six continents. 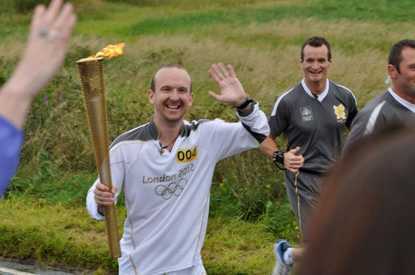 He is a fellow of the Winston Churchill Memorial Trust and was an official Torchhbeaerer of the 2012 Olympic Games. His tales of transforamtion and adventure are sure to educate and inspire every audience. "Thank you very much for your contributions to Country Walking Magazine. When the series started I didn't foresee how honest and open you would be, nor how directly you would tackle such difficult subjects. I'm really pleased at the way it's working, and the impact I'm sure you are having with our readers"
"I was fortunate to meet Stuart a few years ago when he volunteered to contribute to a documentary I was making for the BBC, called ‘Surviving Suicide’. It was a programme that set out to shed some light onto a little talked-about subject, and ultimately help the audience gain some understanding of what can lay behind people’s attempts to take their own life. We met many people in the course of our research but only interviewed a handful for the final programme. It’s a big ask to find people who can speak honestly and eloquently about such a personal subject so that viewers can understand and relate - but Stuart did it so well. He was also our youngest contributor by far, and to have such a youthful voice in the programme was incredibly helpful in communicating that this can happen to anyone, at any time. I had huge admiration for Stuart – firstly for volunteering to share his very personal story on national television, and secondly for his motives for doing so. It was clear from the beginning that he wanted something positive to come out of his experiences, and he saw this as a chance to help prevent other people going through the same pain he had been through, and to not feel embarrassed or ashamed to get help. Judging on the incredible response we had to the programme (nearly 2 million viewers) and helpline, I can safely say he – along with the other people who took part – certainly achieved that."